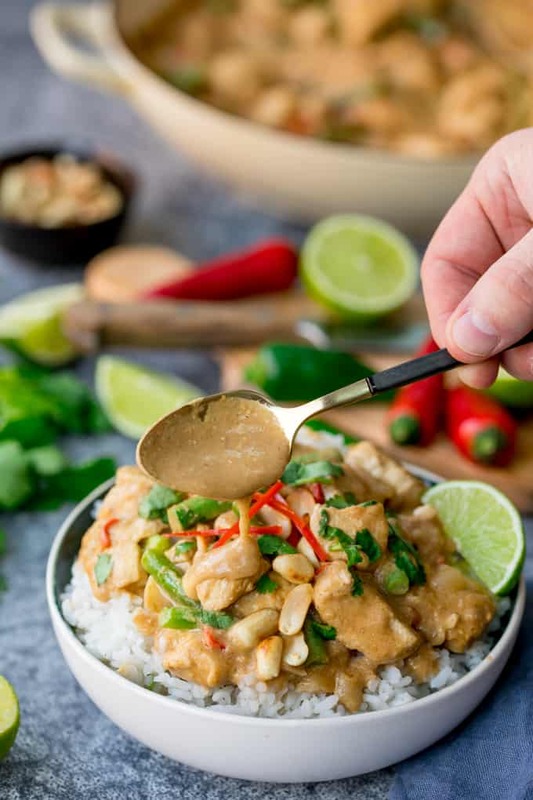 My Peanut Butter Chicken is packed full of flavour and ready in 20 minutes! 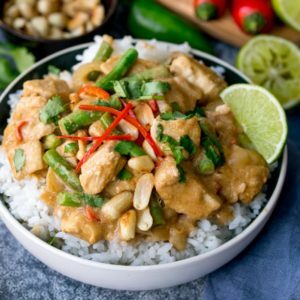 This Thai Peanut Chicken is a great mid-week meal, with no fussy ingredients! 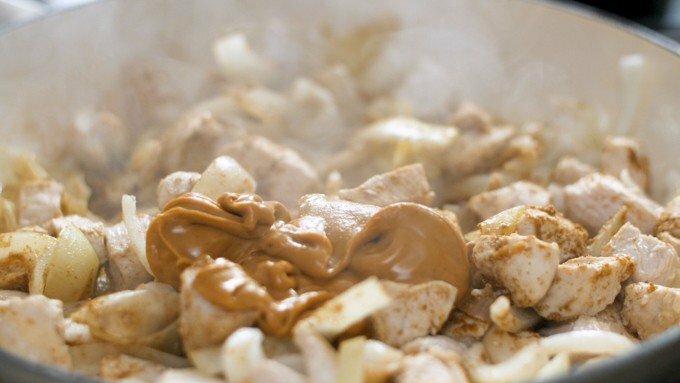 I promise you right now, there is no better use for peanut butter than this recipe! Something magical happens when you mix the peanut butter, lime and chilli to turn this into a lip smackingly great sauce. I love anything Thai, but for once you don’t need all the fish sauce, shrimp paste, tamarind, garlic etc. to get that amazing taste. This recipe was made as part of our 20 minute Tuesday series on YouTube which includes super tasty recipes like my Pan Fried Salmon with Spaghetti, One of Chis’s favourites Crispy Chilli Chicken, awesome Asian Chicken Lettuce Wraps and many more quick and easy meals. Peanut butter – which is something that I HATE on it’s own bleugh! 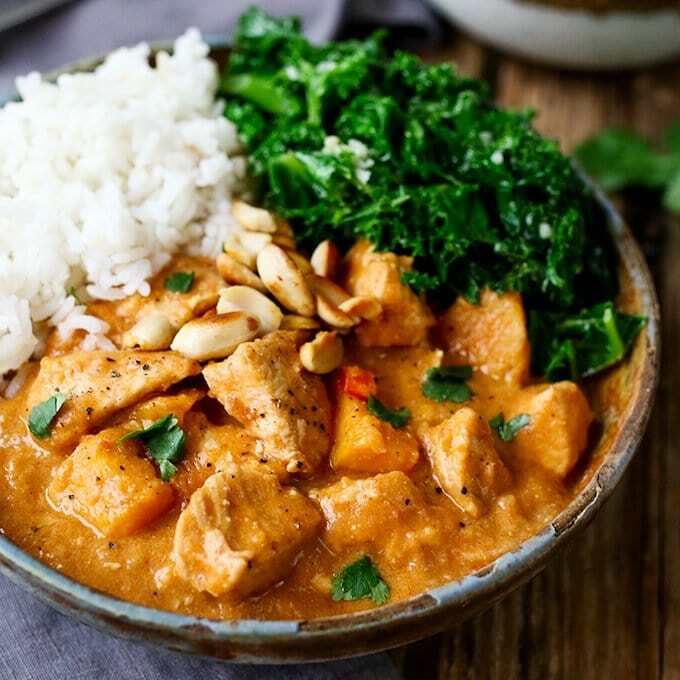 (sorry peanut butter lovers) is 100% the star of this dish. Those red chilli add a great hit of heat, but feel free to leave them out if you don’t like it spicy. It’s all on the table in about 20 minutes, so this is a great mid week meal too. I’ve been making this for years now, it’s one that my mum passed down to me. I still have the recipe scribbled on a scrap of paper, dotted with oil spots from about 10 years ago! Mum’s version also has beansprouts in, which I include sometimes, along with broccoli or mange tout or whatever bit of veg I have around. 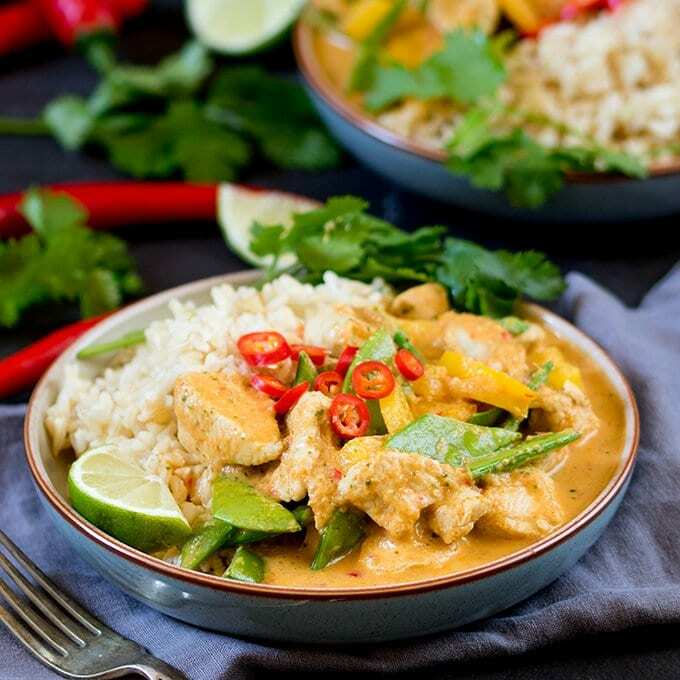 If you’re making this for kids who don’t eat chillies, I’d suggest leaving them out, dishing their portions up, keeping them warm and adding the chopped chillies to the rest of the pan. Then just stir through for a minute or two. 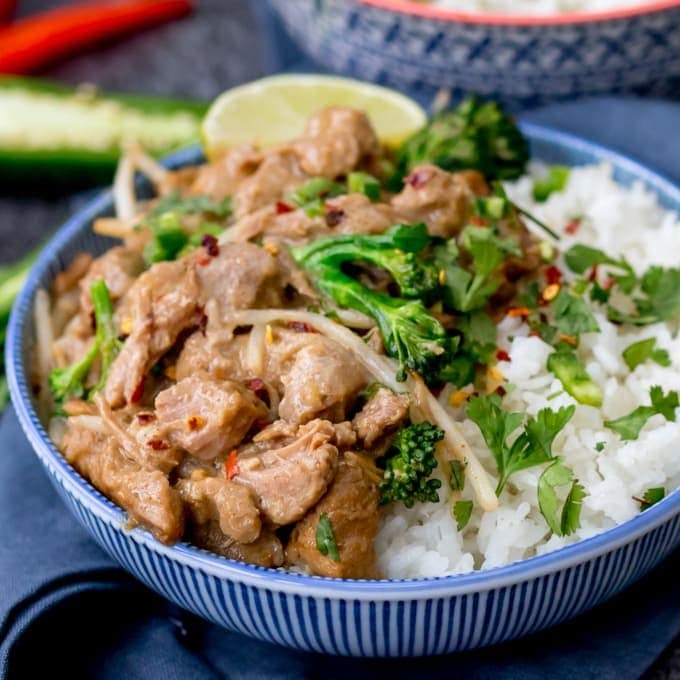 If you’ve tried my peanut butter chicken then please rate the recipe and let me know how you got on in the comments below, I love hearing your thoughts and add-ons to my recipes! 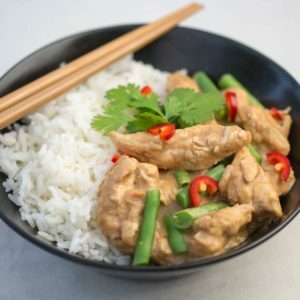 My Peanut Butter Chicken is packed full of flavour and ready in 20 minutes! A great mid-week meal, with no fussy ingredients! A blob of sweet chilli jam also tastes great! If serving with rice, put the rice onto cook first, then you can cook the rest of the meal whilst the rice is boiling. Heat the oil in a large pan that has a lid, over a medium-high heat. Add in the chicken and cook, turning regularly, until sealed (about 2-3 minutes). Add the onion and continue to cook for a further 2 minutes, then stir through the ground coriander. Add in the peanut butter, juice of one of the limes and the stock. Stir, bring to a gentle bubble, then place the lid on and simmer for 7-8 minutes until slightly thickened. Check on it and stir a couple of times to make sure it doesn't catch. Add in the green beans, taste and add in the remaining lime juice if needed. Give everything a stir, and leave to cook for another 5 minutes with the lid off. You can add a splash of water if it's starting to look too dry. Serve with boiled rice, and sprinkle with chopped chillies (or sweet chilli jam) and coriander (cilantro). Yes, make it ahead (without the toppings), then cool, cover and refrigerate for up to two days. Heat thoroughly in a pan, adding a splash of water to help loosen it. Yes! Cool, cover and freeze (without the toppings), then defrost thoroughly overnight in the fridge before reheating in a pan until piping hot. You may need to add a splash of water to loosen it up. Can it be made gluten free? Yes, replace the stock with gluten free stock (water plus bouillon is fine). Make sure your peanut butter brand is gluten free. What if I don't like chillies/spicy food? Leave out the chillies entirely. This meal has still got plenty of flavour without the chillies. Nutritional information is per serving - WITHOUT the serving suggestions of rice and sweet chilli jam. 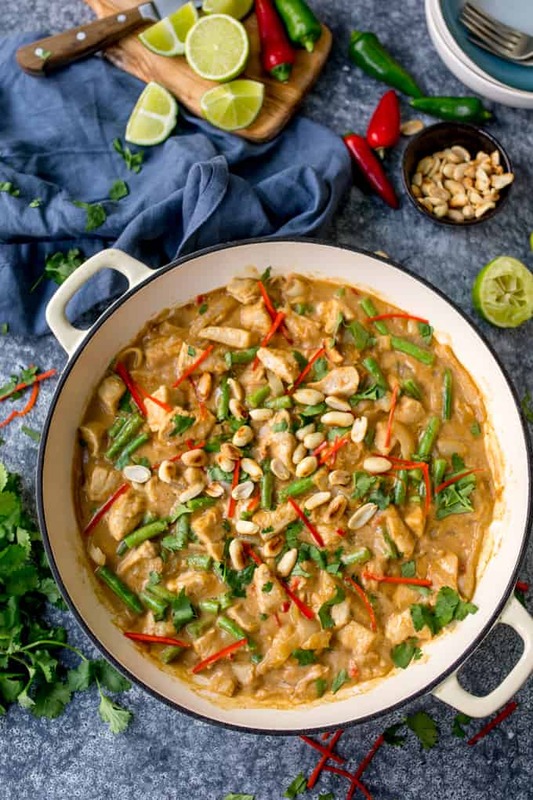 Omg I made this tonight with whole earth peanut and coconut butter – instead of the chopped chillies I added sweet chilli sauce at the end. Thoroughly delcisious and I think it will definitely become one of my weekly staple dishes. Sounds lovely; how much–in ounces–is 300 ml of stock? Thanks. 300ml is around 10 fl oz of stock or 1 and 1/4 cups. Most of our recipes have a **Convert To US Measures** option if you are struggling with any of the other measurements. What a good idea! 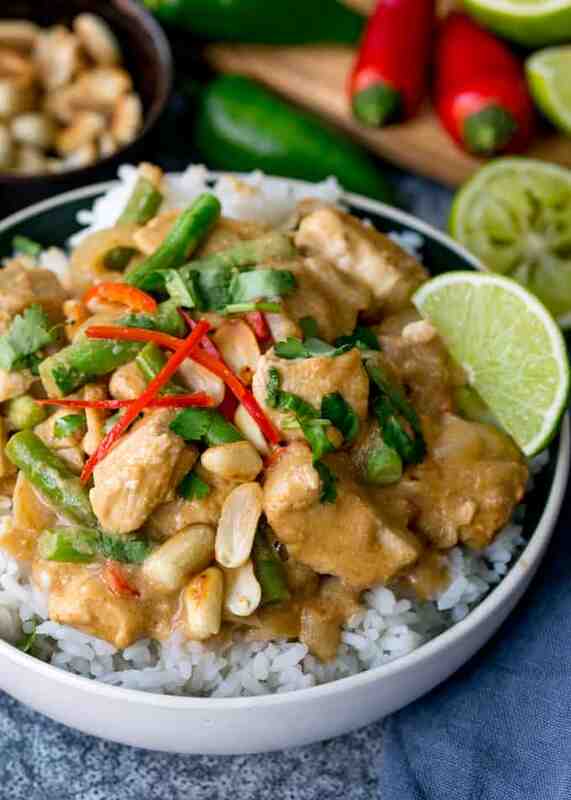 I loooove peanut sauce so I’m sure I would just love this. Plus the extra crunch from the peanuts on top!! Yum! I love how simple this is and that you don’t need all the extra stuff. I love peanut sauce!! This is a difficult one as we have not tried the recipe without the ground coriander and its a main part of the flavours of this dish. 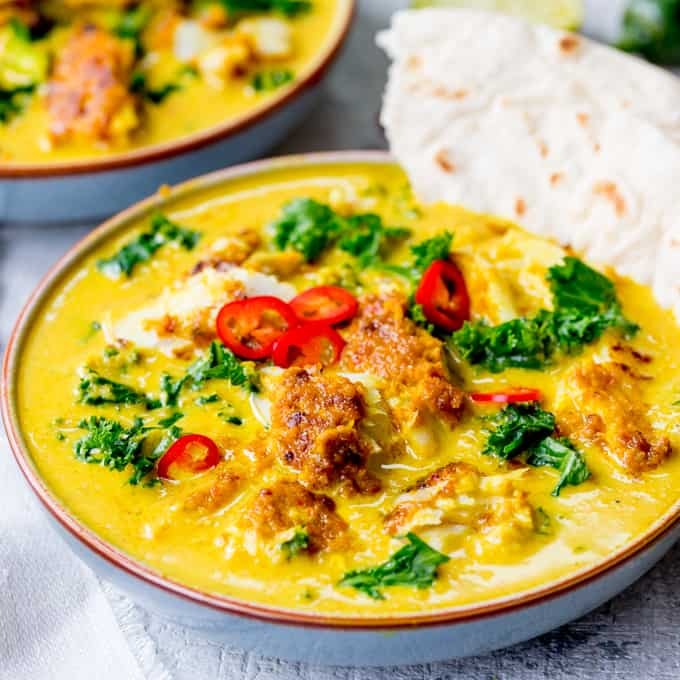 You could try substituting in 1/2 tbsp ground cumin and 1/2 tbsp mild curry powder instead but i havnt tried it so cant vouch for how it will taste. If you do try it please let us know how you get on. I didn’t have coriander either and substituted it with a few sprinkles of cumin. I haven’t had the original recipe but I thought it turned out awesome! 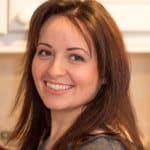 hi…glad to meet you..i loved your yummy blog!!! I love spicy peanut butter sauces. This sounds fantastic. 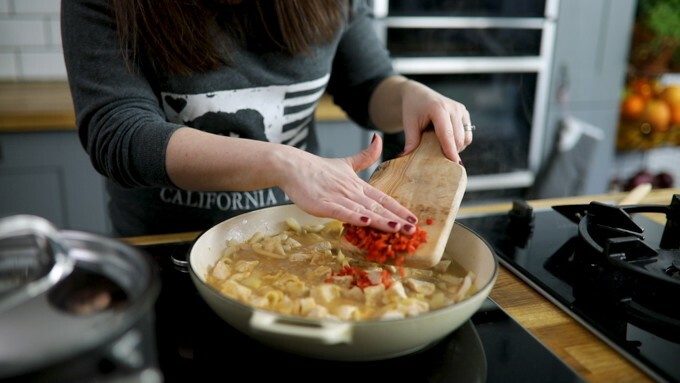 Thanks Corina, it’s so great for a quick mid-week meal! My wife and I have been making this dish for years. I use my own home grown heat that will bring most to their knees. The funny thing is, no matter how hot or how not hot you make the sauce, the flavor is there and though you wouldn’t think it… Peanut butter and peppers go quite well together. Great post, thanks for sharing. Thanks, let me know how they turn out.